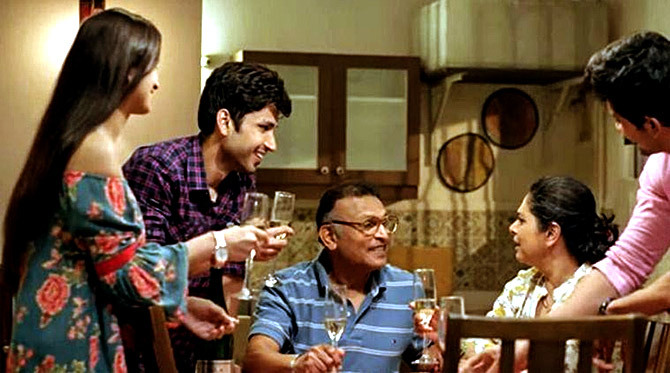 IMAGE: A scene From Habib Faisal's Web series Home. Director Habib Faisal explores a subject close to our lives with his Web series, Home. 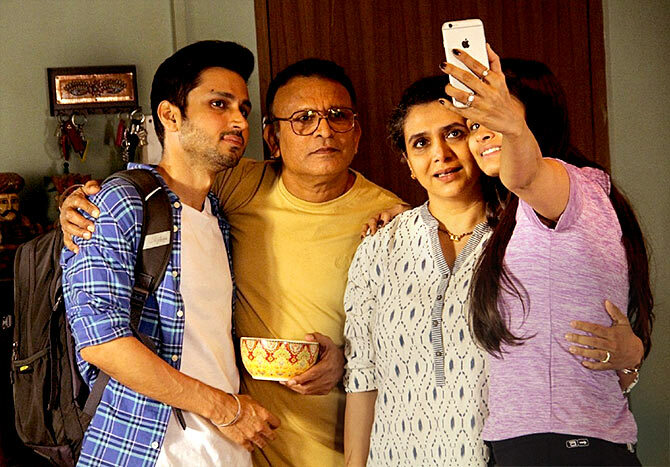 The series, which streams on ALTBalaji, stars Annu Kapoor and Supriya Pilgaonkar, and explores the housing problems confronting India's middle class. "The middle class and Mumbai were the triggers for me to get excited," Habib tells Rediff.com contributor Ramesh S.
When bold and sexual content drive Web series, you have come up with different content. Was it tough for you to get approval? 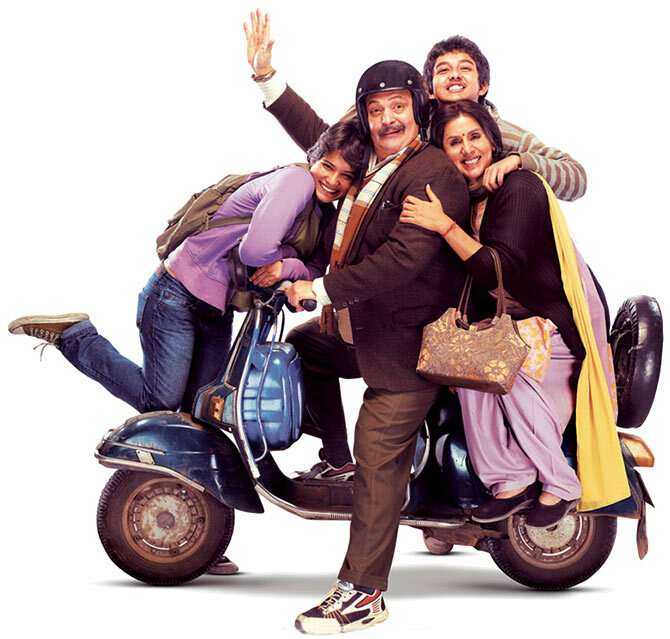 Ekta and Neeraj Udhwani (the writer) came up with the concept where they wanted to make something related to the middle-class family. So they constructed a story that is similar to the Campa Cola society incident. Although it's a fictional story, it is inspired by what the residents of that society or people from all over the country go through when it comes to housing. Ekta and Neeraj worked on a story and concept before hiring me. When I was contacted by the ALTBalaji team, I was told just a line of the story. That line was enough for me to say yes. You have written films like Band Baaja Baaraat, Ladies Vs Ricky Bahl, Ishaqzaade, Fan... What excited you about Home? The middle class and Mumbai were the triggers for me to get excited because my work has been based on such things. Also, the objective was very clear -- a house which the residents will lose and they have to fight for it. Not much work regarding housing issues have been shown to our audience. Some bits and pieces were shown in films like Gharaonda, Khosla Ka Ghosla, and there were some references in Lage Raho Munna Bhai. I got a bit nervous because I haven't done before anything related to it. They contacted me early enough to be a part of the writing process, so I started giving some tips to Neeraj in terms of making this series as cinematic as possible. IMAGE: A scene from Home. Do you feel Indian audiences are ready for such shows? The experience of watching cinema, television or a Web series are poles apart from each other. When you watch a film, it is an event. Even if the audience doesn't like the film, 99 per cent of the audience will not walk out of the theatre. Such viewers are called a captive audience. On the other hand, television is something than always runs in the background. One is doing something or the other -- eating, drinking, chatting and so on -- while the TV is on. Now, the audience for a Web series is not captive, so the writers and directors have to engage them every second. Our Indian Web audiences are quite varied in nature. For instance, South and Bhojpuri-dubbed films have suddenly become a huge thing on cell phones. The key point here is that there is some collective thing that they are identifying with -- whether they are the outlandish action scenes of South films or the naach gana of Bhojpuri films. We are quite confident that this housing concept, with all its emotions and drama, is something our Indian Web audience will identify with. The same question was asked before the making of Do Dooni Chaar. When I started to pitch my story of a middle-class family and the struggles they face when they decide to buy their first car, everybody was surprised with the idea at first. But when they heard the screenplay, they enjoyed it thoroughly. Ekta candidly confessed that she is equated with scandal, sleaze and shocking types of content. So it's gutsy on her part that she is not bothered about questions like whether our Indian audience is ready for such types of Web series. Honestly, the taste of our Indian television audience has been changing all the time -- from Kyunki Saas Bhi Kabhi Bahu Thi to Uttaran/ Now, it has gone into fantasy like Naagin. IMAGE: A scene from Rishi Kapoor's award-winning film, Do Dooni Chaar. The trailer of Home reminds us of Do Dooni Chaar. Was it a conscious decision to bring out that feeling? No, it came by default. Home is an edgier version. People always find Do Dooni Chaar sweet, but I never found it like that. I was trying to get people acquainted with the nakedness of middle-class people and the battles that they fight. I found it a tragic comedy film in that sense. Ultimately, it's ironic what they are fighting for in the film -- a car! But this is darker because the housing concern is like a do-or-die scenario for the residents. At the same time, it's not like fighting against the bad guys of the municipal corporation -- these are simple officers who are doing their duty. IMAGE: Another scene from Home. There is a subtleness in your characters in Do Dooni Chaar. Will we see that in the characters of Annu Kapoor and Supriya Pilgaonkar in Home? Some of it has to do with me being Bhopali. I like to observe people. Some of it has to do with my theatre experience, where the pitch is very different from other media. Some of it has to do with my experience of meeting different people in life. So, when I write characters, I don't have actors in mind. For instance, I wanted to recreate my father in Do Dooni Chaar. In this case, I tried to focus on the biggest fear of middle class people: 'Will I fail'? 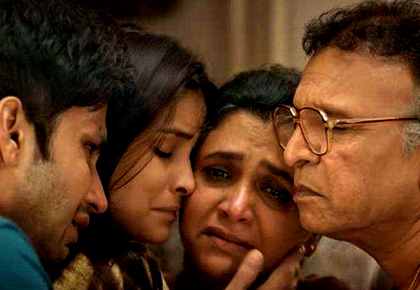 Annu Kapoor's character is a very scared middle class person. If I had chosen someone who is physically frail and looks scared, that character would not have been entertaining. In Vicky Donor, Annu Kapoor's character is a doctor facilitating a sperm donor... I wondered what is his life story. So I just removed the wig of that doctor's character, told him to bring down the Punjabi mannerisms, but to keep up that same energy. Also, to maintain that dominant emotion of fear of the middle-class person. The same goes for Supriya (Pilgaonkar). When I saw her in Jai Mata Di, it blew my mind. The film is a simple narrative where a man and woman are not married, but need to rent a place, which is given only to married couples. Supriya plays an actor-turned-mother figure of that unmarried couple who is being hired to convince the broker that they are a happily married couple. She played it like a crazy wicked woman; one doesn't get to see that side of her. I figured there is a lot to explore in her. Also, when the script was in the developing phase, I felt that although it is a Mumbai-based story, the presence of Mumbai was somewhat missing. 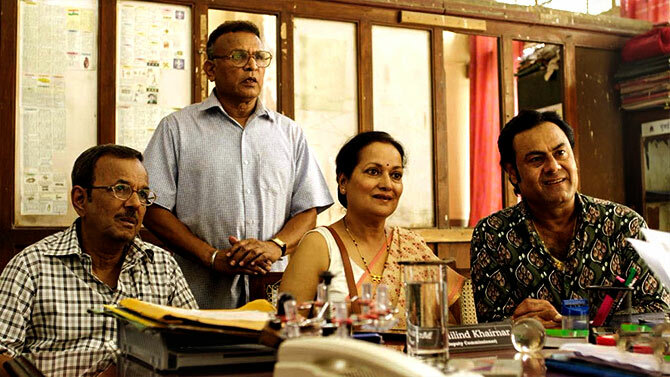 So I insisted that if Annu Kapoor's character has a Punjabi background, the wife should be Maharashtrian. 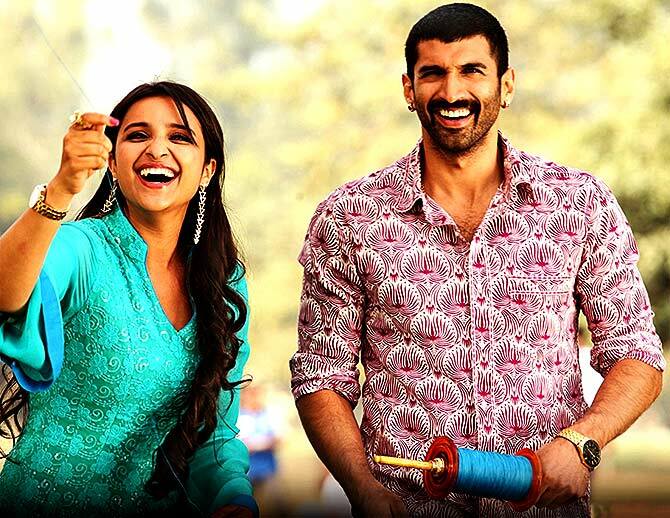 IMAGE: Parineeti Chopra and Aditya Roy Kapoor in Daawat-e-Ishq. How did you handle the failure of Daawat-e-Ishq? When Dawaat-e-Ishq released, I went to a therapist. I simply could not get it out of my system; I could not write anything. I recommend that everybody must seek help, whenever and from wherever it is possible. I had to go through a huge speed-breaker to accept that I had a problem and that I have to deal with it. Even Do Dooni Chaar did not find its leg in theatres. People loved it more on television. Qaidi Band was a washout and a bigger disaster than the rest. I learnt my lessons on how to deal with such things post Dawaat-e-Ishq. With Web series like Sacred Games and Bose, the level has been raised to a certain bar. Do you think Home will cross that? We are confident about the content of our series. It is meant to resonate with the audience. We have done our hard work to make it a cinematic experience.